To celebrate the App Store’s fifth birthday last week, Apple gave away 10 paid games and apps, five of them games. And surprise, surprise (not really): At least one of those games, Infinity Blade 2, made out great on the deal. The action-RPG sword-fighting game added 5.7 million new players in seven days. Laura Mustard, publicist for the game’s developer, Chair Entertainment, said 1.7 million downloads occurred on Monday, the first day of the promotion. Those new downloads, three times what the iOS-exclusive IB2 gets in a normal week, amount to a short-term spike that could pay off big in the long term. Like many other games (most of them free-to-play), the normally $6.99 Infinity Blade 2’s revenue is bolstered by in-app purchases of virtual gold currency. With a couple million players who got in the door for free, it doesn’t take an economist to wonder if they might be in a gold-buying mood. However, Mustard downplayed the importance of in-app purchases for the game. “While we normally notice an increase at times when we’ve done free promotions, we don’t think it’s significant, because the game is balanced in a way that does not require any IAP,” she wrote in an email. She also noted that downloads of the game’s ($5.99) predecessor, Infinity Blade, also spiked, with 2.5 times more downloads compared with the week before. 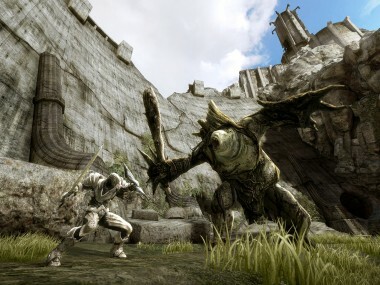 Sales of Infinity Blade: Awakening, a $2.99 e-book bridging the plots of the two games, were also up by about 70 percent last week. Combined, the two Infinity Blades, both published by Epic Games, have now sold almost 50 million copies over the past two and a half years. A repeatedly delayed prequel, Infinity Blade: Dungeons, was officially said to be canceled last week. I reached out to, but have not yet received numbers from, the four other developers whose games were available for free last week.